Contractors share best practices for irrigation maintenance to keep clients happy. Dilluvio says one of the easiest fixes – but most overlooked – in maintaining an irrigation system is ensuring your clients aren’t overwatering. If they call and say their systems aren’t working properly, what could be happening is that they’ve set it to a schedule and assumed their plants would get the right amount of water that way. He recommends telling clients to start with a bit of water and increase the frequency only after plants show some stress. Controllers can also be set to adjust watering times like a bell curve. Start watering in April, then continue to up the amount until the middle of July. After that point, it’s time to decrease frequency through the end of fall. WiFi controllers that are set up for predictive watering also help, too, so that they will shut the irrigation system off if there’s rain in the forecast. Kinsey knows many people are still practicing irrigation maintenance the same way they may have a decade ago, but he says that’s a mistake. Technology has continued to advance and water saving strategies have developed so much that it would be wasting time and resources to keep operations at a status quo. Kinsey also recommends formulating a list of questions to ask clients when they call with maintenance concerns. “Ask the things that will lead to results,” he says, which include prompts like, Was the system working before? When did you notice it not starting to perform? Is there any construction in the area? How old is the system? “Use your knowledge to your benefit,” Kinsey says. Neusteter works in California, which has infamously limited rainfall, particularly in recent years. She says ensuring that the client’s controller works is vital to avoid wasting any of that water. “Good planning in the very beginning and having a controller do what it’s supposed to do is critical,” Neusteter says. She urges contractors to install rain sensors no matter where they are across the country, but especially in states prone to droughts. She says it’s $20 in upgrades that could save the client hundreds. Most of Neusteter’s landscapes don’t need any irrigation from October to March, not to mention the three times a week she knows some people water their plants. Explaining this to clients is perhaps the best maintenance you can do, she says. The range of deck sizes and attachments available makes it a relevant workforce in a contractor’s equipment arsenal. Walk-behind mowers are a tried-and-true member of a well-rounded fleet, and their ability to tackle tight turns, squeeze through fence gates and navigate curvy landscape bed edges separates them from their larger, ride-on and stand-on counterparts. Not to mention, walk-behinds can safely handle slopes and uneven terrain. For all of these reasons, the walk-behind plays an important role in a company’s arsenal of equipment – whether you’ve got a few mowers or 40. Ben Wright, director of field operations at Canopy Lawn Care in Raleigh-Durham, North Carolina, has a staff of 75 and services only residential lawns. “So, our setup is a little different,” he says. Sixty percent of Wright’s fleet consists of walk-behind mowers. That includes a range of 21-, 36- and 48-inch deck machines. His company also operates 36- and 48-inch stand-on mowers. No matter what he’s buying, the top priority is quality of cut. Walk-behind mowers come in a range of sizes, operator controls and engine configurations. So what should you consider before making a purchase? When it comes to engines, both hydrostatic and belt-drive transmissions both have their benefits. Alex Calle, owner of Two Brothers Landscaping in Parsippany, New Jersey, generally goes for hydrostatic walk-behinds because of their instant-turning capabilities. “The maneuverability is night and day compared to a belt drive,” he says. That said, Calle has 36-inch belt-driven walk-behinds in his fleet because they are more cost-effective in that deck size. “We don’t use the 36-inch mowers too frequently – only in areas where we can’t fit a 52-inch walk-behind,” he says. Wright likes hydrostatic mowers because of their efficiency. “You can really turn better, and you don’t get scuff marks on the lawn when you turn,” he says. Most of his walk-behinds are hydrostatic, however he does have belt-drive mowers for flexibility. And having different mowers doesn’t cause a problem with getting parts because of his vendor’s selection, Wright says. Accessibility of parts and dealer support are key factors Calle weighs into any mower purchase, including the 15 walk-behinds in the fleet at Two Brothers. “Price point is important also, and we go with brands that have been out there for a long time,” he says. Grass catcher: Spring and fall cleanups are faster with a grass-catcher that collects leaves, twigs, acorns and other debris that gets caught in the turf and must be raked or blown out for a clean cut. Grass catchers are available in a range of sizes, from your basic bagger that fixes to a 21-inch deck walk-behind to large, lightweight aluminum versions that attach to generous-sized machines. Rake dethatcher: Whether you’re prepping a lawn for overseeding or just getting rid of all the dead stuff that can cause matted, too-dense turf, a rake dethatcher lifts the burden of having to do this back-breaking job manually. (And, what company can make a profit hand-raking a lawn?) Rake dethatchers can be attached to the front of your walk-behind so they remove thatch and leaves while you cut the grass. Sulky: Get wheels for your walk-behind and let the self-propelled engine give you a lift. Sulkies come in a couple different configurations: a standing sulky and sitting sulky, some of which can include handlebars so you can steer the mower. Before making a purchase, we recommend test-driving a sulky for comfort, ease of use and ability to maneuver your machine. Deck size is one benefit of walk-behinds because they can fit into spaces that some ride-on and can’t. “Being primarily residential, we have routes where the majority of properties have fenced-in back yards,” Wright says, noting that the gates are often too small for a 48-inch deck. In fact, Wright builds routes based on mower type and size. That way, he can group machines in a trailer, saving crews time switching back and forth between mowers. At Two Brothers Landscaping, large area walk-behind mowers with 52-inch decks handle wide open properties. Aside from the generous walk-behinds, the company also has 20 40-inch stand-on mowers. “But, they are not too good on hilly terrain, so that is when we use the walk-behinds,” Calle says. Because half of Calle’s walk-behinds are equipped with sulky attachments, his crews gain the operator efficiency that stand-ons offer. Not to mention, the sulkies prevent fatigue. But, walk-behinds aren’t always the best machine for the job. “With our stand-ons, the mower layout allows the operator to see straight down over the area they are mowing, whereas that visibility can be taken away when using a walk-behind mower,” Wright says. On the other hand, walk-behind mowers shine in tricky lawn layouts. “On technical areas with lots of tight, small, curvy areas and sloped terrain, our operators can take their time with the walk-behind and they almost have to pay more attention to where they are going,” Wright says. Ultimately, the key is to have options, which is why walk-behinds complement stand-on, ride-on and zero-turn mowers. Wright’s three-year old company has been acquiring equipment regularly to keep pace with growth. “We like to keep a variety because it gives our operators flexibility,” he says. Trucks are the workhorse of your operation. When it comes to trends and upfitting, safety is on everyone’s mind. Your truck can be a marketing tool, a garage on wheels and a way to get from job to job, but manufacturers are noticing contractors seeking out bells and whistles that make their vehicles safer, more comfortable and more adept to the job. “Across the board there’s more safety type items that people are looking for in their trucks,” says Brian Tabel, executive director of marketing for Isuzu. Certain safety features like backup alarms have been installed on trucks for years, but Tabel says customers are requesting and expecting more enhanced safety features as they purchase and upfit their vehicles. For landscapers completing their routes in residential neighborhoods, Tabel says a low forward cab option is better suited for the job. “They’re driving through neighborhoods and there’s kids, no matter how small, they could be really low to the ground. I’d go with a low cab forward,” he says. At Navistar, Director of Product Marketing Chad Semler says safety is key for their customers as well. Semler specializes in medium-duty vehicles and sees the drive for enhanced safety coming from business owners. “Both from a business owner point of view and a driver point of view, and convenience and comfort point of view – (customers) like to have those safety features,” he says. Backup cameras are becoming more standard options on work trucks as professional customers start looking for the same features that ordinary passenger vehicles have. “More and more people have become reliant on backup cameras and especially now with commercial vehicles, it definitely makes sense to include that feature,” Tabel says. He also sees lane departure notifications and alerts becoming a feature that more and more contractors seek for their vehicles. “Passenger vehicles are setting the stage,” Tabel says. He also says Isuzu is gearing up to add more passenger vehicle features to their trucks like a notification system that alerts a driver to any cars on either side. “Medium-duty and heavy-duty trucks are kind of following that path but are usually a few years behind (passenger vehicles),” he says. Wider ramps for unloading heavy equipment are just some of the popular upfitting options for work trucks. Serious business aside, Tabel says there are some accessories and enhancements that landscape contractors might want to upfit their vehicles. Chrome accents like grills are always popular additions after contractors make their purchases. Tabel says they add aluminum wheels and wheel simulators. Inside the vehicle, it’s still all about comfort. Semler says business owners are really focused on making sure their workers have a comfortable cab to sit in. “In order to keep the driver (happy), a driver wants to have a newer truck,” he says. Certain features can also serve as both a luxury and a safety measure. Some states require drivers to be hands-free while using their phones, so Bluetooth capabilities are becoming more standard. At Morgan Truck Bodies, Paul Jarossy, director of business development, says contractors are looking for easier ways to get equipment in and out of their trucks. Narrow ramps don’t work well for hauling heavy equipment, so Morgan designed a space-saving ramp stored in the back door that extends all the way across the bottom of the box truck. “It allows the truck to have full flooring and that way contractors can fit more equipment inside,” Jarossy says. Before contractors decide they want all the shiny extra features on their trucks, manufacturers agree it all comes down to actual truck use. Jarossy says the general design of a box truck is pretty standard, but contractors can customize and upgrade the interior depending on needs and budget. He says contractors should feel like they can be walked through exactly what they need (and don’t need) when it comes to enhancing their vehicles. If you’re looking to fit two or three mowers in your box truck, it’s probably not going to make sense for you to add a work bench to the front of the truck, Jarossy says. “It’s up to us to find out what the needs are and what the customer wants to do with the truck,” Semler says. “So it makes a big difference in what they go with.” A common piece of equipment to add-on is a tree chipper, he says. And for those contractors who need that type of equipment, a certain type of truck will be required to carry that weight around. “What will you be towing with the truck? Will you be pulling equipment since you’re a landscaper? Are you going to need to pull a (skid-steer) behind your truck? That makes a big difference in terms of your gross weight,” Semler says. Popular additions to upfit trucks are racks to hang tools and a side opening door to get easier access to the inside. Jarossy says the side door might be something added on if a contractor decides to add a work bench to the front. “They can fix a broken belt or other equipment right on that surface,” he says. Another useful way to upfit your vehicle might be to add a gasoline pump. “When they want to add gas to their mower, they don’t need a truck full of those gas cans,” Jarossy says. See what the next generation wants from employers and how to connect with horticulture students. Speaking to a room full of landscapers about the next generation of horticulture professionals, Brigham Young University professor Phil Allen shared some recent stats about his post-Millennial students. Alyssa Brown, one of Allen’s students who will graduate from the program this April, was shocked by the landscapers’ response. Not sure how to connect with this new crop of potential employees? Here’s what the next generation of landscaping students expect from job opportunities in this industry, and some tips for appealing to this future workforce. 1. They want a plan to advance. Mark Pipper entered college in a pre-dental program, but after working a summer job at a landscaping company, he changed his major to pursue a career in the green industry. He graduated from Hinds Community College in 2008 with a two-year degree in landscape management technology and earned his Bachelor of Science in landscape contracting from Mississippi State University in 2010 with the goal of starting his own business one day. Pipper worked several landscaping jobs after graduating. After over three years at one job, he left for a similar position at another company that offered a clear ladder for advancement. So, students might need to temper their expectations if they expect to climb straight to the top of the ladder. TIP #1: Offer clear, flexible career paths to show new hires opportunities for growth at your company. 2. They want a good culture. After Pipper moved into a management role, another company recruited him for a similar position with slightly better pay and benefits. It seemed like an upgrade, but he soon realized that the ideal job isn’t just about growth opportunities, good pay and perks. Even with those benefits in place, the company culture can make all the difference. Culture was so important to Pipper that he ultimately decided to start his own company, S&P Outdoor Services, in April 2018 to establish the values he thought a landscaping company should commit to. “Honesty, integrity and the best quality work that clients can get – not necessarily at the cheapest dollar, but an affordable amount,” he says. Allen knows this because as part of his senior capstone class, students submit a final paper titled, “Key Systems in My Ideal Company.” Company culture is an increasingly common topic. In fact, when Brown wrote this paper last year, she focused mainly on culture. TIP #2: Communicate your company culture, mission, vision and values, and pay attention to how those are reflected in your work environment. Alyssa Brown will graduate from the landscape management program at BYU in April. She says her generation is willing to work hard, but they also want to collaborate and work smarter when possible. An owner recently told Allen that he’d spent $3,000 recruiting a particular student into his company, only to realize three months after hiring her that he hadn’t once spoken with her. Rather than providing a smooth transition through onboarding and training, he just assumed she’d figure it out on her own. “So many employers hire a new grad and make all the right promises, then the person comes to the company in the springtime, their busiest season, and gets thrown into the work with little to no guidance,” says Brown, who’s experienced this at several companies already. As frustrating and overwhelming as that can feel to students, Allen says it can be disastrous for companies from a safety perspective. In every “Key Systems” paper he graded last semester, students shared examples of this. “Without exception, every single student had a very bad experience where they weren’t given adequate instruction or given more responsibility than they could handle, because the supervisor didn’t recognize the need for training,” Allen says. Allen is reading a book that claims as many as 44 percent of employees leave a job within the first three months – often resulting from lack of training, uncertain expectations or feeling unwanted. TIP #3: Develop an onboarding program that engages new hires and provides training for a smooth transition into your company. 4. They want to work smarter. Brown was once assigned to work a job with another crew that needed assistance. The project involved several crews working several laborious hours without sufficient organization. Frustrated by the inefficiencies, Brown came up with some ideas to optimize the process – reducing the work from three hours to about 30 minutes, requiring fewer crews. Today’s grads want to work in an environment where they can contribute to make improvements. They want to explore alternatives and innovate new solutions to move their team ahead. TIP #4: Invest in new technology and invite all employees to contribute ideas for improving efficiency. Hit the ground running this season with these equipment maintenance tips. 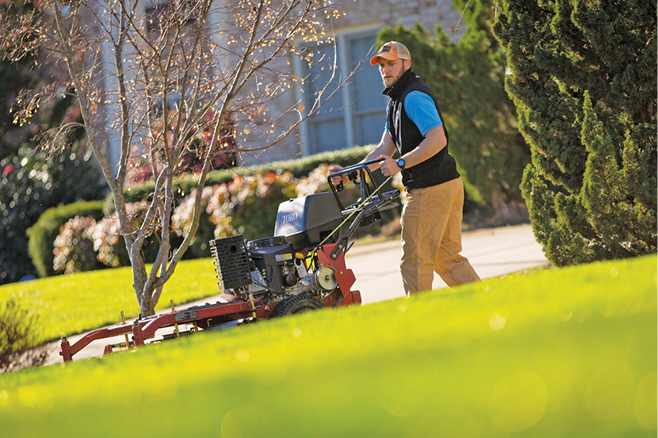 Gearing up for the lawn care season can seem daunting. Between hiring seasonal staff, selling contracts, training crews and making schedules, it’s easy to let something slip through the cracks. But making sure your equipment is ready to start service will help you save time and money all season long. We gathered up some tips from LCOs across the country to see how they get their equipment ready for spring and make sure it runs all season long. Crews at Arlington Lawn Care in Erie, Pennsylvania, make sure all of the equipment is ready to go before leaving for any job, any time. That means tight blades, belts and gas caps. "I tell all my guys, make sure your tools are sharp because another one of the big accidents that happens out on the field is when you’re using a dull set of pruners,” says owner Rich Arlington. With a dull blade, technicians are working extra hard to prune branches, which can result in cut fingers or hands. "It's just easier if you always make sure your tools are sharp," he says. That’s why each Monday, Wednesday and Friday the in-house mechanic sharpens every single piece of equipment. When it comes to trimmers and edgers, properly maintained equipment should last at least a few years, says Andrew Morse, department head for maintenance at Belknap Landscape in New Hampshire. He recommends changing blades on them each year and placing trimmers and edgers on racks when transporting them to various job sites. At Rothschild Lawn Care in southern Florida, Kevin Rothschild makes maintenance a part of the daily routine for crews. Each technician is responsible for cleaning their equipment and checking for any leaks, bad connections or other issues. If there is an issue, equipment is marked for repair and placed in a special area of the shop and a replacement is used until the equipment is fixed and returned to the rotation. At the beginning of the season, Frank Capone at Capone Landscape in Wakefield, Massachusetts, makes it a point to have all handheld tools inspected. Taking stock of the tools gives him an idea of how many he’ll need to replace later in the season. Lawn treatments involve harsh chemicals and herbicides that can deteriorate metal over time, causing clogs and reducing equipment performance. At Arizona Weed King, teams clean and recalibrate their equipment at least once a month to minimize this factor. Ensuring the correct output crucial to sprayer and spreader applications, so John Benefield, lawn care specialist at Green Leaf Nursery in Kentucky, pays close attention to the maintenance schedule in his owner’s manuals and checks output regularly. “That’s the thing about two-cycle equipment: The best thing you can do is run it every day,” says Chester Buczynsk, owner of Big Lakes Lawncare in San Antonio, Texas. “Most people, they use their chain saw every week or the weed whip once a month, and the carburetor gums up and things get sticky and gooey inside, and then you’re having issues with a seemingly brand-new chainsaw because you’ve only used it three times. Though he doesn’t specifically trade out equipment so it sees daily action, he does rotate it regularly through his crews. To avoid problems the following season, you have to make sure everything is clean before it’s stored for the winter to prevent rusting, corrosion or leaks, says Ron Evans, owner of Green Up Lawncare in Texas. They don’t leave anything to chance and spend a full day at the end of the season cleaning out equipment and properly storing it. “We have some fun and bring in lunch for everyone because that’s the same day we do our inventory and it’s just sort of a good way to say, ‘Hey, we did it. We made it through another season,’” Evans says.